Here are my top recommendations for healthy travel essentials this Summer! Happy Summer, y’all! With schools out and temperatures quickly rising, many folks (myself, included) take advantage of this glorious season with a good ol’ vacay. And because of this, I wanted to share with you my favorite healthy travel essentials! My husband and I are in the midst of planning two trips right now. He’s amazingly detail oriented. I am…well, more of the creative big picture person, i.e. don’t depend on me to schedule flights, etc. And in the midst of him rattling off the details, my mind (in typical Tina form) found itself contemplating the concept of a vacation. People gravitate towards traveling for a variety of reasons, and certainly these reasons change with the ebbs and flows of life. Some get amped for adventuring and exploring new places. Some count the days to be able to wake without the sound of an alarm clock and do little but leisurely enjoy a book, poolside. Others simply yearn to return to a coveted location, eager to build new memories with loved ones. Regardless of what motivates us to take vacations, I think we can generally all agree that taking a break from our normal every routines can be refreshing for the mind, body, and spirit. Because raise your hand if you’ve ever counted down the work days to escape to a much needed vacation, only to come home 7 days later more exhausted than before you left. But the more I vacay with sincere intention and commitment to taking better care of myself, the better I’ve gotten. Much like strengthening a muscle. So I decided to compile some of my favorite healthy travel essentials! Whether you’re headed hiking, to the beach, amusement park, or just wandering a new city, you owe it to yourself to take care of your largest organ. That would be your skin! Summer means stronger rays of sun. Please, please, please protect yourself from the potential of skin cancer! And yeah, wrinkles, brown spots, and general signs of aging. I would be lying if I said I don’t enjoy the warmth against my body on a bright, bluebird day. I used to be a total sun worshipper. I have the price dearly and learned my lesson though! So that means extra sunscreen for me! Previously I avoided sunscreen on my face because it broke out my sensitive skin and too often skipped it. Good news, there are so many options available now for even the most delicate of skin. I try to utilize at least SPF 50+ EVERY.SINGLE.TIME I leave my house. Make it a habit and carry your sunscreen in your purse/bag/car. I personally really like Colorscience’s Sunforgettable Mineral Powder for Sensitive Skin, SPF 50. It’s super easy to apply, portable, and also serves a bit as a mattifier on a sticky hot day. I know several Dermatologists that also recommend this sunscreen. You can purchase it at many Derms’ offices or you can also get it on Amazon here. Another fav of mine is BeautyCounter’s sunscreen. It’s all natural and works well on the rest of my body. I’m not a rep so I can’t sell it to you, but I’m sure if you ask around on social media you probs have at least 2-3 friends that can point you to someone who does. Besides being super sensitive, I tend to have combination skin. And it also gets really dehydrated when I fly. One way I’ve found to maintain proper pH balance is utilizing a toner (even taking it with me on flights!). I really like this natural one called Thayer’s Witch Hazel with Rose Petal. It’s alcohol-free and includes moisturizing aloe-vera. It seems to clarify my skin and simultaneously reduce inflammation. You can purchase it here. The perfect toner for healthy traveling skin! Squalane oil all the freakin’ way. If you haven’t read my post about this magical oil, start here. Basically, it’s like someone found a unicorn, stole all it’s tears, and bottled them for your beautiful benefit. It’s moisturizing, a great antioxidant, and perfect for sensitive skin. I definitely recommend bringing with you in the car, on the plane, etc. Given my ol’ college nickname was “Snacks”, I might be a little biased about the importance of snack category. Those that know me well can probably attest to the fact that I do NOT do well as a human being when I’m hungry. And given that I have some food sensitivities, I now know it is best that I carry something with me. In fact, regardless of whether you have food sensitivities, I’m a big fan of suggesting my clients bring something healthy along wherever they go, and especially during travel season. Gotta have energy, folks! New Primal Beef Thins: beef jerky but sliced thin like a chip! Also they are grass-fed, Paleo, gluten-free, and no added sugar. And yes– beyond delicious! You can purchase them here. Bulletproof Collagen Bars: No secret that I am in love with almost everything made by Bulletproof and these grass-fed Keto vanilla shortbread are certainly at the top of my list. You can purchase here. Rootz Nutrition Chocolate Banana Nut Superfood Protein, individual serving packs: I am so psyched Rootz sells these superfood protein powders in single serving packets! 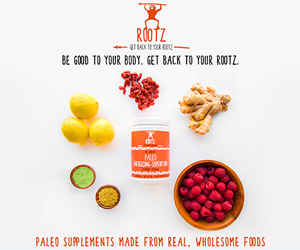 I am really, really picky about choosing or even including protein in my smoothies as many will irritate my digestive system, but Rootz uses hemp protein and I tolerate it very well! Besides being loaded with superfoods like goji berries, chia seeds, spirulina, chorella, maca, and bee pollen… it tastes amazing. Y’all know I dig some bee pollen. When I’m at home, I blend this superfood protein up with some ice. If a blender isn’t available when I’m traveling, I simply add it too a cold water bottle and shake well. You can purchase this by clicking on the picture below! Staying hydrated when you’re traveling is mucho important. Why? Because even just traveling on an airplane in itself is dehydrating. Besides that, on vacation we often participate in activities we expend more energy and yes, sweat. Whether you’re touring a new city, hiking, biking, or even just laying in the hot sun by the beach, you gotta stay hydrated! Failure to do so can cause you to suffer greatly and put you at risk for not so fun things like headaches, nausea, dizziness, etc. Why ruin a precious day of vacay for that?? I carry a water bottle with my EVERYWHERE. But I also only enjoy drinking cold water (high maintenance, I know). So if you’re like me, invest in a thermal protected water bottle. Also, I like mine to be cute. Because of course I do. My favorite go to is by Yeti. I love both their regular water bottle, as well as their coffee travel mug. Fluids stay cool in them for about 24 hours, and hot for about 8 or so. You can purchase at many outdoor equipment stores or by clicking here. A popular reason people yearn to take a time out from real life is often because they are t.i.r.e.d. Life can be exhausting, right? Unfortunately, sometimes getting good quality sleep on vacation is harder than one might expect. Whether it’s jet lag from crossing time zones or just not being able to shut down while in a strange bed, our sleep cycles tend to be thrown off a bit. One thing that has really helped me cultivate better Z’s on trips is wearing an eye mask. I’ve used the Tempur-Pedic Memory Foam eye mask for about 10 years and it was well worth the investment. It’s so comfortable, completely blacks out any light, and doesn’t slide around my face. Highly recommend. You can purchase at some stores in airports, or here. Whether you’re traveling by planes, trains, or automobiles it is easy let the “getting there” portion of a trip become stressful. I always have short guided meditations stored on my phone to access when I just need a few minutes of time out so I don’t punch someone in the face (jk, mostly). I also really suggest bringing a good travel yoga mat. Travel yoga mats is a lot thinner and weigh less than your regular mat, which makes them perfect for packing in your luggage. There are tons of great online yoga sites– I really like Yoga Works. As far as travel mats go, I personally love mine by a company called Peach. It’s designed to give you a good grip even when wet… perfect if happen to spot a fun local hot yoga studio wherever you’re staying! You can purchase by clicking here. My favorite travel mat by Peach! Great grip, light to carry, and durable. Traveling plays such an important role in my life and I do it as often as we can. It’s a big factor of how I personally define my “life in color”. Connecting with new people, experiencing different cultures, and making memories for a lifetime are priceless in my opinion. In fact, I think we’d all coexist in much better simpatico harmony if we placed more priority on stepping beyond of our normal living circumferences (even by a few miles!) more often. And I think we are able to stay committed to our truths of who know in our hearts, as individuals, when we allow ourselves the opportunity to take a time out every now and then. We function better when we’re refreshed and restored. But don’t get so caught up in the excitement of vacation and forget to take care of yourself! If you have any favorite healthy travel essentials I might benefit from, leave me a comment below! Would love to know!